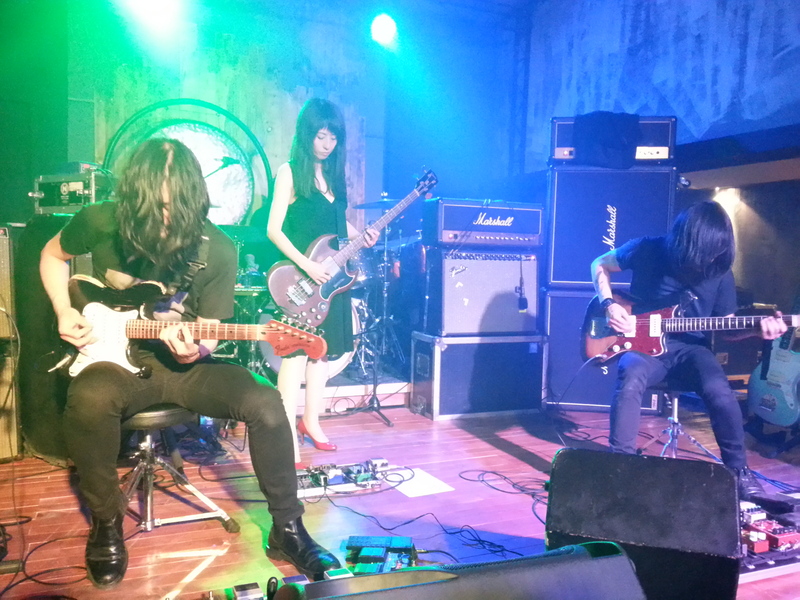 Having unfortunately been unable to make Japanese post-rock quartet Mono’s concert last week in Vienna, it was a very pleasant surprise to arrive in Sarajevo for a two-week visit and discover, quite by chance, that they were playing in the city on only my second night there. Naturally, then, I wasted no time in going along. The venue, the Kaktus, was part of a concrete eyesore, the Skenderija, which had for some reason been plonked slap bang in the centre of the city close to the banks of the Miljacka. Taking the form of a long, thin bar with a low stage at one end, the Kaktus was slow to fill up on this Monday evening but eventually swelled pretty much to capacity. There was a palpable sense of occasion among the audience; I can’t imagine that many touring groups make it down to Sarajevo, and certainly not too many Japanese outfits. I congratulated myself on getting there early doors and securing a vantage point at the front, since the low-slung nature of the stage meant that those further back would have been able to see precious little. Such considerations assumed particular importance in this case, since Mono’s two frontmen were to spend most of the concert either seated on stools or crouched low down on the floor. The entirely instrumental music of Mono is a thrilling journey of epic proportions. Lonely, desolate threads of guitar pick their way through a barren landscape of ruin and emptiness, stalked by eldritch rumblings of bass and drums. Occasional interventions on keyboard and glockenspiel add to the looming sense of dread and unease, until the guitars and drums lock together and rise up in apocalyptic unison. Ratcheting up the tension in the merest of increments, the group transmute gaunt and skeletal melodies into red-hot cauldrons of burning intensity. Clearly the leader of the group, Takaakira Goto is mostly responsible for those weeping Fender runs. When he’s not huddled over his instrument, his long dark hair entirely obscuring his face, he’s drawing patterns in the air or coaxing ever more funereal lamentations from the impressive range of effects pedals at his feet. Rhythm guitarist Hideki Suematsu takes a more circumspect approach, meting out clouds of riffage around Goto’s lacerating lead guitar. Wearing a fetching pair of red high-heeled shoes, bassist and keyboardist Tamaki Kunishi is a towering centre-stage presence, while Yasunori Takada augments his mighty drumming with occasional recourse to a large gong suspended behind his kit. Although Mono clearly bear some sonic resemblance to Godspeed You! Black Emperor, their vast crescendoes and tidal waves of volume make them an electrifying proposition in their own right. The similarity doesn’t end there, though, since there’s an aura of mystique around the group that chimes with the dark progressions of their music. Over the course of the two-hour set, the group didn’t speak to or even acknowledge the audience once, nor did they respond to the fervent calls for an encore. Afterwards, though, they were all smiles, happily signing autographs and posing for photographs with the considerable knot of people who had stayed behind. “Wow!” mouthed Neil Cowley to his bandmates Rex Horan and Evan Jenkins, over the warm applause that greeted the appearance of Cowley’s eponymous trio on the stage at Porgy & Bess. The Londoner was clearly pleasantly surprised by the fact that he had attracted a near capacity audience to Vienna’s premier jazz club, especially since, as he himself admitted, “the last time we played here, there weren’t that many people.” Looking back through the archives, I found that their previous visit was in October 2012, just a few days after my great musical hero, Peter Hammill, had graced the same stage and complimented the venue on its Fazioli grand piano. Although Cowley didn’t make any specific comment on the Fazioli himself, it certainly sounded (to my untrained ear) like an instrument more than capable of reflecting the twists and turns of Cowley’s effortlessly variegated playing. Back in 2012, of course, I was shamefully ignorant of Cowley’s music, a situation only rectified last year when I reviewed his then new album Touch and Flee for The Quietus. That record has remained a firm favourite with me since then, so it was a sheer delight to hear it performed straight through as the first set of this concert. With Horan issuing moody runs on double bass and Jenkins a dartingly creative presence behind the kit, Cowley’s virtuoso mastery of the keyboard left me slack-jawed with admiration. Frequent words, smiles and glances between the three of them testified to the rock solid status of the trio as a unit, not to mention the pianist’s occasional bursts of laconic humour between tunes. Live as on record “Sparkling” was a gorgeous highlight, its timeless summery beauty inscribed deep in its surging, blissful melody. The jaunty “Couch Slouch” lightened the atmosphere considerably, while “Mission” built on a rickety toy piano intro to reach a stirring, animated conclusion. Cowley promised to “play the hits” in the second set, and he wasn’t joking. Not that he’s likely to trouble the charts any time soon, but riproaring tunes like “We Are Here To Make Plastic” and the stunning closer “She Eats Flies” were as winning and immediate as anything I’ve heard done in the name of jazz. Elsewhere, the pianist dedicated the fleeting and delicate “Box Lily” to his prematurely born daughter, who had spent the first three months of her life in an incubator. Head bowed in thought, hands gently giving shape to the flecked radiance of the piece, Cowley was momentarily revealed as a loving father as well as a gifted pianist and composer. Although undercut by his trademark wit and humour (“she’s now seven and she’s a right pain in the arse”), it was a deeply poignant and tender moment in a concert filled with wonderful things.